With the popularity of radio in the thirties, starting in the Netherlands, the privatelocal radio broadcasts. Apart from the illegal character (one had even thenhave to broadcast), these devices are not always trouble-free for legitimatesenders and receivers. In order to detect the illegal stations using the radioinspection service of the State-owned PTT of cars equipped with sensitivereceivers and equipment. 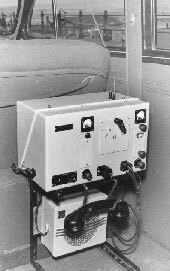 The first experimentsTwo or three of these standard cars drive from different directions to the stationand then by comparing the measurement results and the listening station islocated. It will be appreciated that a good communication between the cars is extremely important. This communication is at the time of telephone contact at agreed times, which is often dependent on private telephone. Radiotelephone, ie a call via a radio transmitter and receiver, in the thirtiespossible. The equipment, however, has considerable dimensions. In 1934starts the radio PTT laboratory to experiment with the construction of a ‘small’portable transceiver. The first tests are taken with a radio on short wave in the range of 60-70 megahertz. The antenna must be used here is ‘only’ 1 meter long. After this trial period you submit in 1937 a number of Dutch companies, the demand for a practical transceiver design. All this equipment was over 3months late delivered not least because the manufacturers struggled to meet the technical requirements. The study extended to two areas: a journey of about 30 km. around The Hague and a ride through the narrow streets of downtown. At the outbreak of the war on May 10, 1940 are approximately 150 piecessold to police, fire, medical services and utilities. A few pieces after allinstallations by the Germans confiscated. The design of the Dutch Signalling Equipment Factory (NSF) in Hilversumappears best to comply, then in the autumn of 1939, 200 pieces ordered. Thismobile phone, for that is the mobile phone still is not truly portable and must be mounted in the car, for example behind the seat of the passenger. To have a conversation with another mobile phone or a subscriber of the fixed line, thehelp of an attendant be invoked. One of the few specimens recovered after the war is preserved in the Museum for Communication.